Although all of Cadia Village has been surveyed, first in 1997, then in 2000-2001, there was one area where buildings could have been located without leaving any trace. Most of the building sites had been revealed by a scatter of artifacts and terracing into the hill slope. On flat ground nothing need survive. This was the case for the Chaplain’s House, where the only physical indication of occupation was the brick lined well, some fruit trees and stone rubble. South of the Chaplain’s House was an area of flat land, above the immediate flood plain of Cadiangullong Creek. This was an ideal area for building. Was it used during the period of the Mine from 1860s onwards? It was decided to put in a series of test-trenches to find any archaeological remains. Using a mechanical excavator to strip the topsoil in trenches, 10 metres apart and 2 metres wide, it was intended to widen the trenches into area excavations wherever there were concentrations of archaeological features. 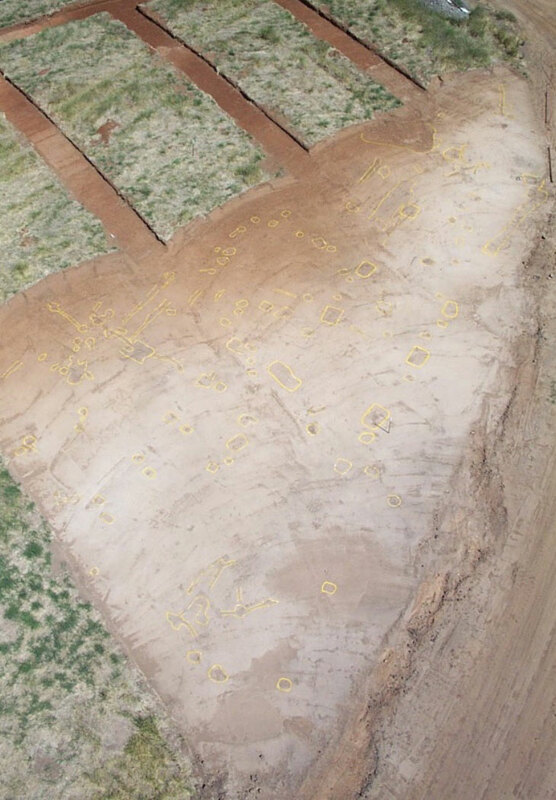 The test-trenching revealed the presence of two previously unknown buildings. One was a shed (Site W005), measuring 6.6 by 5 metres, and constructed with a frame of posts and horizontal plates, similar to traditional agricultural buildings. On its north side was a brick lined trench, its side and end walls constructed using sandstock bricks, while its base and sloping south end used firebrick, all bonded with lime mortar. The brick types, all without frogs, suggest a date before the 1880s. The artifact scatter was small, but indicated use of the building, possibly up to the 1870s. The sides of the brick trench had been squeezed together over the years by the reactive clay on either side, but measurements taken at the base, show it was too narrow for a sheep dip, being only 0.36 metres wide (1 foot 2 inches). The building appears to have had an unspecified agricultural or industrial use. Further south, the test-trenches exposed the footings of a larger building (Site W006). The artifacts suggested use up to the 1870s, as with the nearby shed. Although built as several components, the main building measured 22.9 by 8.1 metres (75 feet by 26 feet 6 inches), with two recognisable annexes. Pairs of posts extend beyond the north wall of the structure. Again the building was constructed using posts and horizontal timbers, as in many traditional agricultural buildings. Various uses for the building were considered, including a woolshed or barn, but were discounted. An industrial use, associated with the mine, seems most likely, an interpretation that is supported by the large quantity of scrap iron found at the south end of the building. The scrap was similar to ironwork recovered from Smelter No. 1. This building lay beside the slag road, the main route between the Cadia Engine House and the Smelting Works. 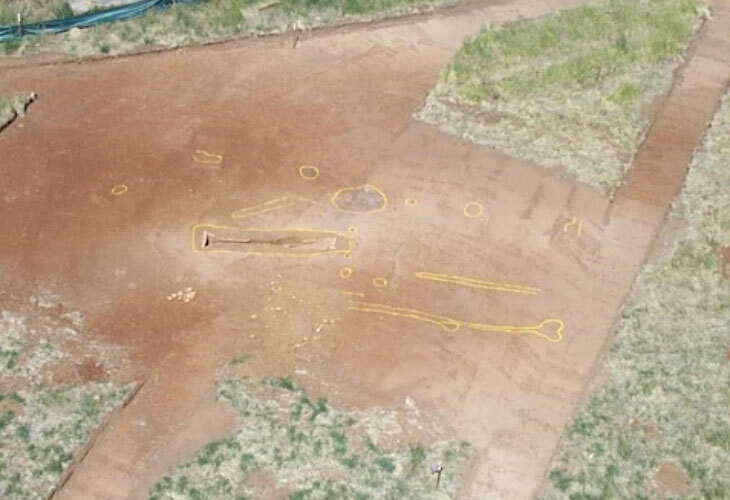 The various post-holes and slots of the shed and brick trench (Site W005) are marked in yellow survey paint to make the features discernable in the dry conditions (Edward Higginbotham, 2002). The test-trenches reveal the footings of a large industrial building, associated with the mine and dated up to the 1870s. Scrap iron was found in the building, similar to that found at Smelter No. 1 (Edward Higginbotham. 2002).